Yessir, it's time once again for Atlanta to bestir itself down to the Cobb Galleria Center, and the Waverly, and what soon will be the new Braves stadium, and gird its loins for the 22nd annual Anime Weekend Atlanta! What started out in 1995 as a gathering of a few hundred die-hard Japanese cartoon nerds has become the Southeast's pre-eminent gathering of twenty thousand die-hard Japanese cartoon nerds. 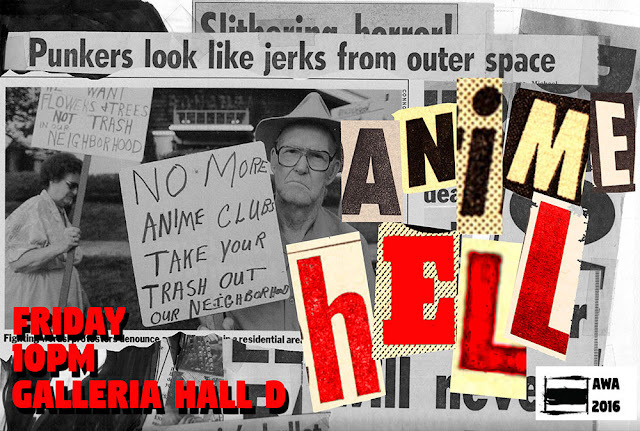 And as one of the founding members of this august body of Japanese cartoon nerds, I'll be front and center delivering the kind of unprofessional yet self-important scholarship that anime fandom would be lost without. You want to make sure you're there on Thursday to pick up your badge in time to visit the Super Happy Fun Sell, a yard-sale swap-meet of fans feverishly selling their previously loved used anime merchandise to wide-eyed bargain hunters. We sold out every table this year so it's gonna be crazy in there!! Then on Friday you don't wanna miss the opening ceremonies because I might clock you in the eyeball with some Dubble Bubble gum from my sniper's next onstage in the glare of the spotlights, opening yet another AWA with a firestorm of candy. 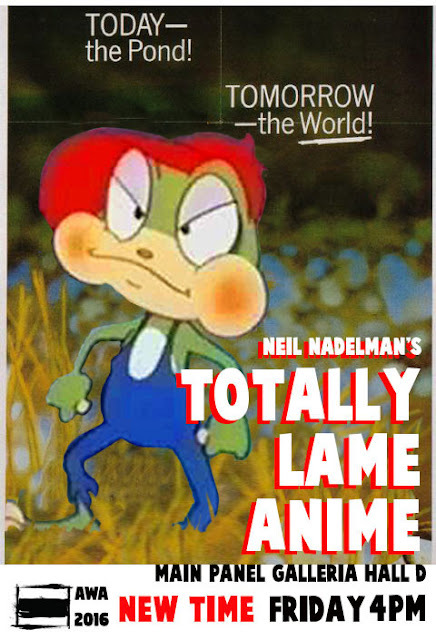 Stay close to the main stage because at 4pm that's where anime translator extraordinaire Neil Nadelman presents his world-famous Totally Lame Anime! Remember, if that pond's a-rockin', don't come a-knockin! 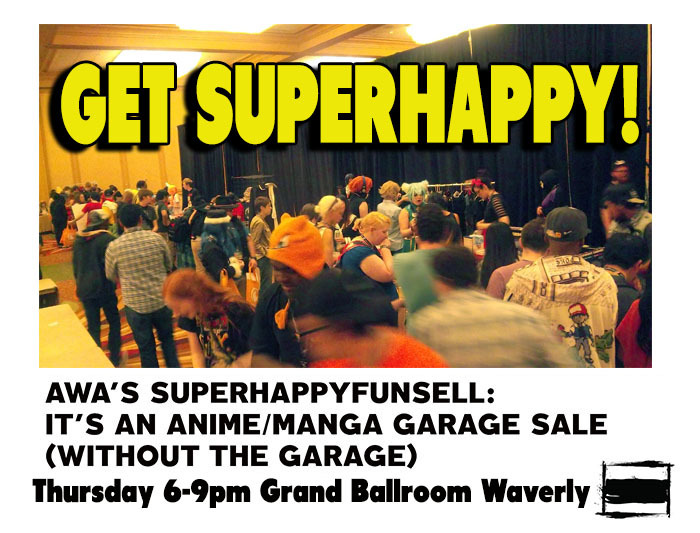 Afterwards you might want to hit the dealers room or watch some anime or see some guests or snap some cosplay pix, but stick around because at 10pm I drag AWA back down to Anime Hell! It's two hours of confusing ambiences and ill-timed shorts, mixed with crazy ads, old safety films, that rock music the kids seem to like, and Galaxy Goof-Ups aplenty. 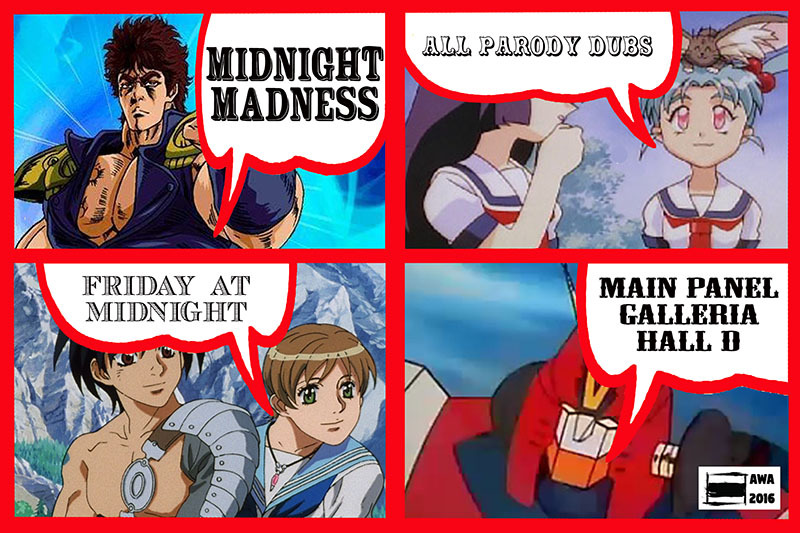 And then stick around because midnight is time for Midnight Madness! Yes, the famous parody dub celebration returns with all your favorite cartoon characters mouthing swears. It's a riot and guaranteed to make you laugh til your guts bleed, as the teeners say. 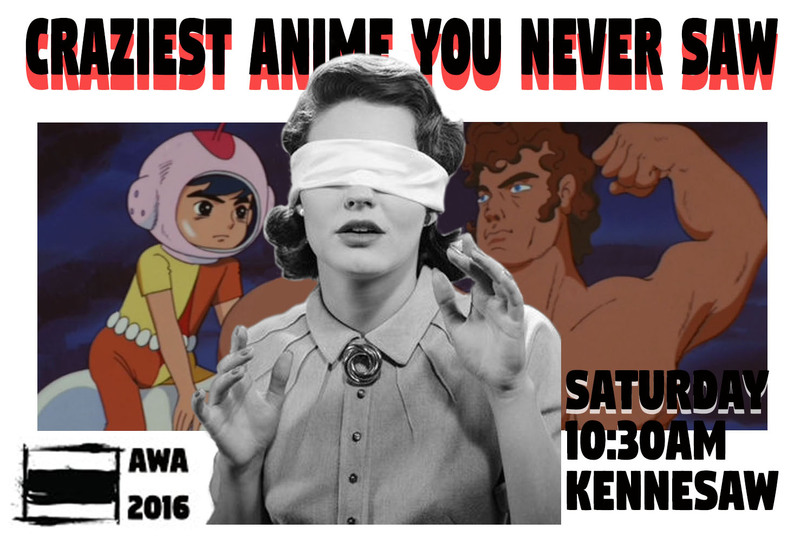 Saturday morning you're gonna wanna get up bright and early, though, because it's time to find out all about the Craziest Anime You Never Saw! The Kennesaw room will be the scene of enlightenment as Americans learn of amazingly weird cartoons that not only were never imported into the United States, but will NEVER be imported into the United States, and I make this bold and definite statement in the fervent hopes that somebody out there proves me wrong. I dare you to release these cartoons. I double-dare ya. Anybody? 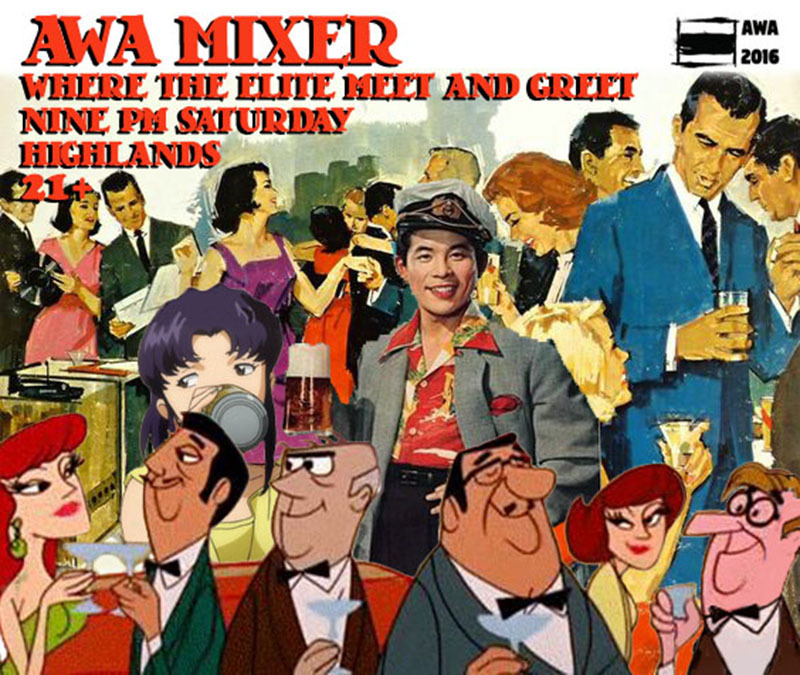 Stick around Saturday night and make some new pals at the AWA Mixer! 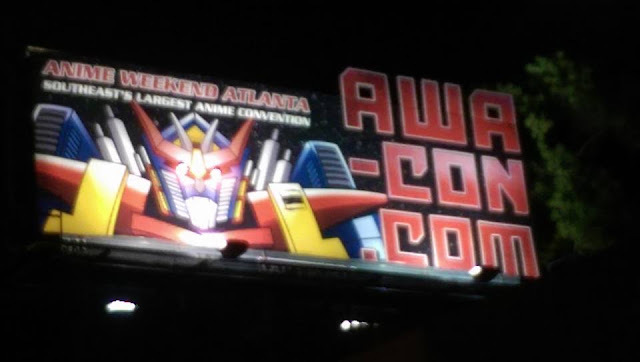 Yes, it's a place for the grownups to meet and greet and have grownup conversation about real estate, insurance, retirement plans, and transforming super robots and idol singers. There's a cash bar and plenty of friends you haven't met yet, so be there! Mention Let's Anime and I might get you into the secret after party. 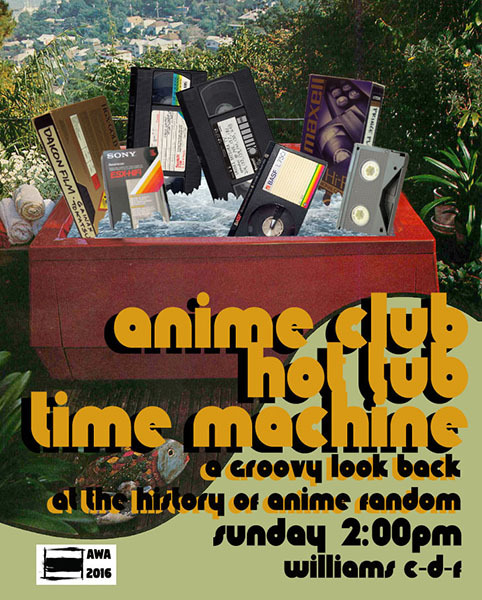 Sunday afternoon it's time to relax a little, let your inhibitions down a bit, and slide into the Hot Tub Anime Club Time Machine! Let those bubbles take you back to the early days of anime fandom where we'll find out exactly what these proto-otaku were watching and how they were watching it, and with whom. And then, before you know it, another AWA fades into the distance in our rear-view mirror! It's gonna be a super blast and you GOTTA be there. Find out all about how and when and where - here!